She's the artist formerly known as Kim Crow. Crow at London 2012, dreaming, perhaps, of bigger things in four years. 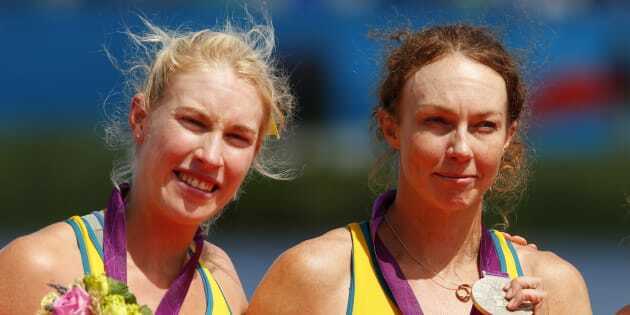 Australia is sending one of its strongest ever teams to an Olympics. We are also sending one of our smartest. We all know about champion swimmer and budding physicist Cameron McEvoy and canoe slalom queen Jess Fox who was dux of her high school despite missing half of year 12 while competing. Now meet Kim Brennan. The 30-year-old was formerly known as Kim Crow before she married Olympic gold medalist rower Scott Brennan in December, 2015. Kim is a lawyer. She also happens to be a champion rower who won silver in the double sculls and bronze in the single sculls at London 2012. Really??? 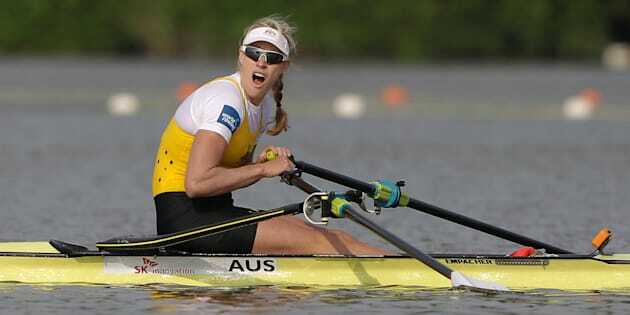 Kim is shocked to learn she's just won the first of her two world championships in the single sculls. This one was in 2013. The next came in 2015. She's only gotten better since then and has been undefeated since 2014. It's been two surnames and two Australian prime ministers since she lost a competitive race. 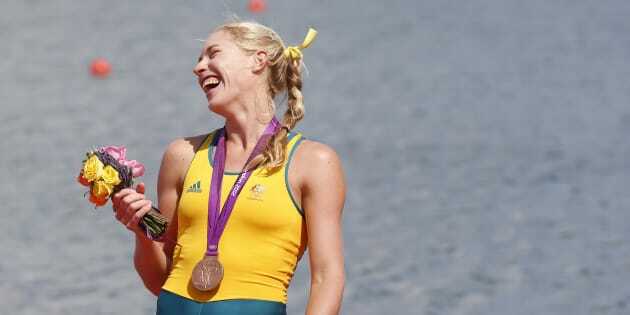 If you had to bet on one Australian bringing home gold from the murky waters of Rio's Lagoa Rodrigo de Freitas, it'd be Kim. The Huffington Post Australia caught up with Kim before she heads over to Europe to prepare for the Olympics. As ever, we kicked things off with the big issues. Ant: Hi Kim. We start by asking every sportsperson this for reasons which are not clear to anyone. Who would win a fight between a kangaroo and an emu? Kim: Oh gee, that's hard (long pause). I think I'll go for a kangaroo. Living in Canberra they're everywhere here. A kangaroo chased my labrador once. Ant: So a kangaroo would win a fight between a kangaroo and a labrador then too. Ant: You used to be a 400 metre hurdler back in the day before switching to rowing. Did you ever beat dual world champion Jana Pittman? Kim: I actually think I might have once but I'm pretty sure she fell over so I'm not sure that really counts. She was actually pretty far ahead of everyone. As an athlete you always have to believe you have a lot of improvement, but the switch turned out to be fantastic. I'm much better suited to rowing. I have loved every moment in this sport. If bronze made her this happy, imagine what gold will do. Ant: And you're even more dominant now in rowing than Jana was in her prime as a hurdler. How long since you've lost a race? Kim: (An even longer pause than the kangaroo/emu pause) It's not actually that long because I've been racing in boys' races in ACT regattas and they towel me up. Ant: Nope, we're not counting that. How long since a woman beat you? Kim: I think maybe the 2014 world championships. Ant: Wow, a two year winning streak, which our readers should know includes the single sculls at the 2015 world championships in France. Do you think much about keeping the streak going all the way up to and including the Olympics? Kim: I think it's really something we don't think about too much. I'm really focused on how much I can improve. You learn when you win but you also learn when you lose. I'm just trying to peak in Rio. I think when you get get into a race it's actually quite an amazing space to be in. It's like everything's happening really, really slowly. It's an emptiness of mind but also a clarity of mind. When I have my best races there's a lot less chatter. Each stroke is creating the next stroke like a mantra or a rhythm. Ant: Have you ever rowed the perfect race? Kim: I don't think so. The closest I came was with Brooke [That'd be Brooke Pratley, with whom Brennan won silver in the London Olympics double sculls behind the British duo. The video is here]. Sometimes you just have to appreciate that we were up against an incredible combo. But Brooke and I were able to walk away really happy that day. Kim and Brooke with silver in London. Kim has won countless races yet names this as her favourite. There's a message here, kids. Ant: I love that your favourite race is one you didn't even win. So you don't subscribe to the motto "second is first loser" which I've heard some Olympians say. Kim: No, we put so much into the journey and we enjoyed everything along the way. We were definitely very proud of our performance. For me it hasn't always been about the result and the colour of the medal. Ant: That's such a healthy attitude. And now it's just you in the single scull. No crew, no teammates, just you. Do you prefer that? Kim: Interestingly I have raced internationally in every Olympic boat class. I think initially the team aspect was what drew me to the sport. There's something indescribably special about a whole crew working together. 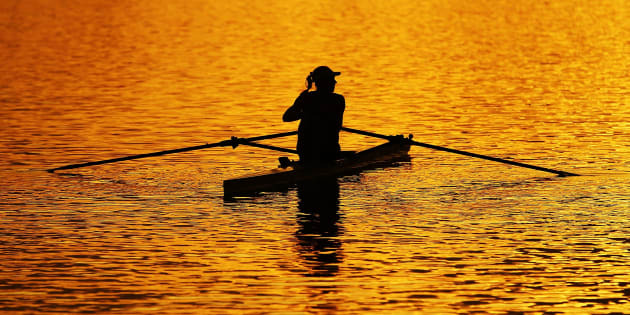 In the single sculls, everything that happens in the boat is because of you. You have a clarity of assessment because your performance is entirely up to you. It took me ten years of my career to be ready to accept the fullness of honesty of the single scull. Ant: I think "honesty" is a really interesting word choice there. What do you mean? Kim: Single sculling holds you to account. It is a very difficult boat to row. It's very narrow and particularly hard in tricky conditions if you get wind or roll, it's possible to fall in. So I think any little mistake is amplified in a single scull and the feedback is so instantaneous. It's the ultimate boat for taking responsibility for your own actions. 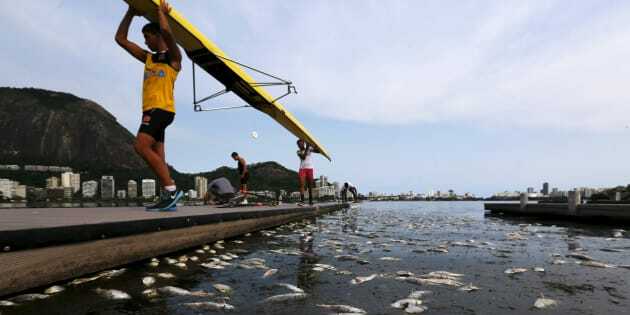 Ant: Speaking of tricky conditions, there have been reports this year showing the lake in Rio has been full of garbage and dead fish which we assume they'll clean up before the games. But it's also a fairly open body of water so you'll have to expect wind, right? "Catch" of the day. That's a rowing joke. Kim will get it. Non-rowers, see about three paragraphs below. Kim: Yeah I've rowed there and from about the 750 metre mark the course opens up into quite a large body of water which means there's more space to pick up a roll or a wave. It definitely adds a different element to it. But where I train on the lake in Canberra it can be a mill pond some days and really windy with a side roll other times. The good news is the rowing will be quite early in the morning in Rio [when there's likely to be less wind] which has the added perk of being in prime time back home in Australia. Ant: What do you actually think about during a race? Kim: I think when you get into a race it's actually quite an amazing space to be in. It's like everything's happening really, really slowly. It's an emptiness of mind but also a clarity of mind. When I have my best races there's a lot less chatter. Each stroke is creating the next stroke like a mantra or a rhythm. When you're in a crew boat, communication is part of your job. As a single sculler, the trick is to be at one with the boat and how it's moving through the catch [the moment the oar strikes the water], accelerating through stroke and being conscious of those changes. Ant: Conscious but on a kind of subconscious level. I love this sport. So tell me, do you come home and talk rowing with your husband or is it the last topic of conversation? Kim: No, we very rarely talk about it although if I do have issues in training or rowing, he's a great person to talk to. But he's a doctor in the emergency department at Canberra Hospital these days, so that puts everything in perspective. Ant: I read an interesting interview with your coach Lyal McCarthy. He said he knows when to press your buttons and when not to. What did he mean? Kim: When I'm exhausted he encourages me. When I'm doing good times he helps me go a bit further. He also does a lot of little things that make life easier for me. I'm a very punctual person and like to get places on time. He knows I like things just right and spends a lot of time making sure my boat's perfect. 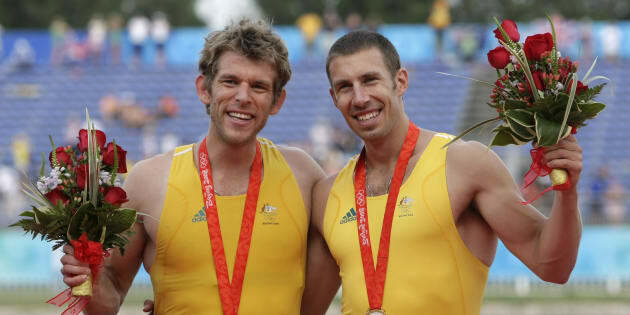 That's Kim's husband Scott Brennan (right) with David Crawshay after winning gold in double sculls in Beijing in 2008. Ant: You're the chair of the Australian Olympic Committee Athletes' Commission. Have you consulted with the AOC on the issue of the Zika virus? Kim: That's a good example of how the commission works. Medical director David Hughes has been following all the World Health Organisation advice and has consulted with us. The AOC has made sure that if we want to come back from Rio and start a family, we have the right tests and there's a procedure in place. Cutting through all the sensationalist journalism, the important thing is to have information out there. Kim: My decision is I'm off to Rio. Ant: And we wish you well there. But before we let you go, one question. In an interview we read on the world rowing website, you were asked about the craziest thing you did after the London Olympics. And you answered: "I went to a Thai restaurant and chose a dish other than the Chicken Pad Thai". Kim: I'm pretty conservative. My personality profile is probably quite risk averse. Ant: Hey, there's nothing wrong with Pad Thai. Who doesn't love Pad Thai? We just want to know what your alternative dish was. Kim: I think I splashed out and had a green chicken curry. It was actually really nice.